A modern expression of this type may be found in the Amish communities. These communities are perhaps most well-known for their rejection of technological advancement, but they refuse to embrace other aspects of the predominant civilization as well. With relation to the state, they will hold no public office. They will not join the military; nor will they accept any government aid such as social security. While some of these communities have allowed a craft trade for subsistence, others view even this meager artistic expression as an opportunity for pride. 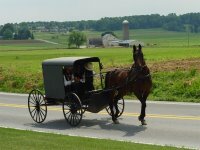 The height of their separation from culture is seen in the fact that the Amish refuse even to even speak the same language as their surrounding culture. Wikipedia provides documentation. In this understanding, the believer is obligated to escape his culture and reconstitute a new culture based on radical obedience to Christ’s commands. Every part of civilization, from technological advancement to orderly governmental rule, from artistic expression to scientific discovery, is viewed with at best with suspicion, disdain, and indignation. The call of God to be separate from the world disallows any sustained contact with people outside the believing community. We will get to some legitimate criticisms of this view in my next post. But I think that we can be too hasty in criticizing this approach and forget our pilgrim status in this age. “Come out from them and be separate, says the Lord. Touch no unclean thing, and I will receive you” (2 Cor 6:17). Adrian's Blog: PROVERBS - Are Bloggers Scoffers? Westminster Wednesday—Who Has Full Assurance?